The Río de la Plata separates the sprawling city of Buenos Aires in Argentina and the quaint city of Colonia del Sacramento in Uruguay. There are just 28 nautical miles between these two destinations, yet, they feel worlds apart. In the large and chaotic city of Buenos Aires, our taxi barreled down a 12 lane highway (yes, 12 lanes) towards the port where we would catch a ferry to our 3rd South American country, Uruguay. Arriving in Colonia was like stepping into a postcard. 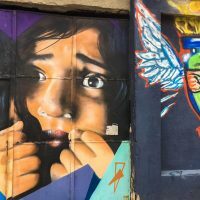 Having spent a month in Buenos Aires, we were accustomed to highrise buildings, enormous parks and grand statues, many of which constructed in Italian Renaissance or art-nouveau style. 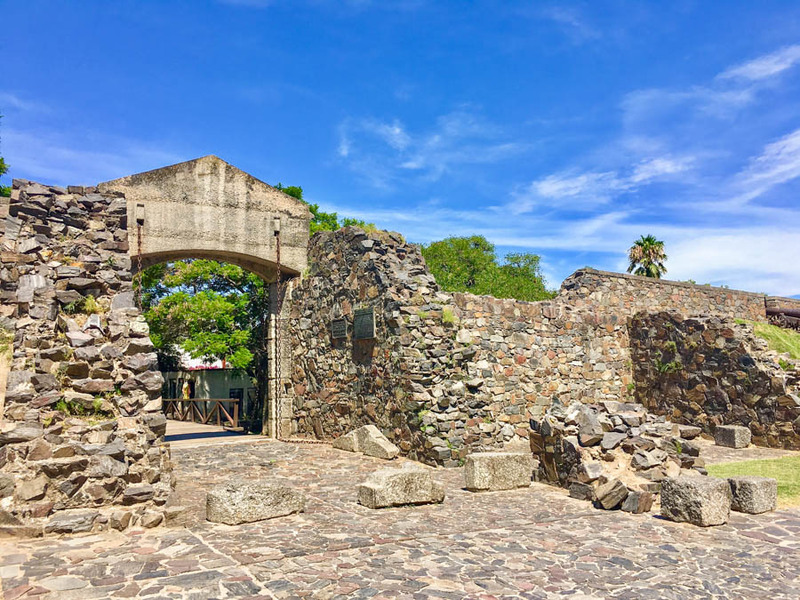 Little Colonia is a Portuguese settlement from 1680. All of the buildings here in the historical neighbourhood are low-rise and colourful, while the streets are narrow and cobbled. There are numerous crumbling ruins and small parks to enjoy. The town was incredibly green. 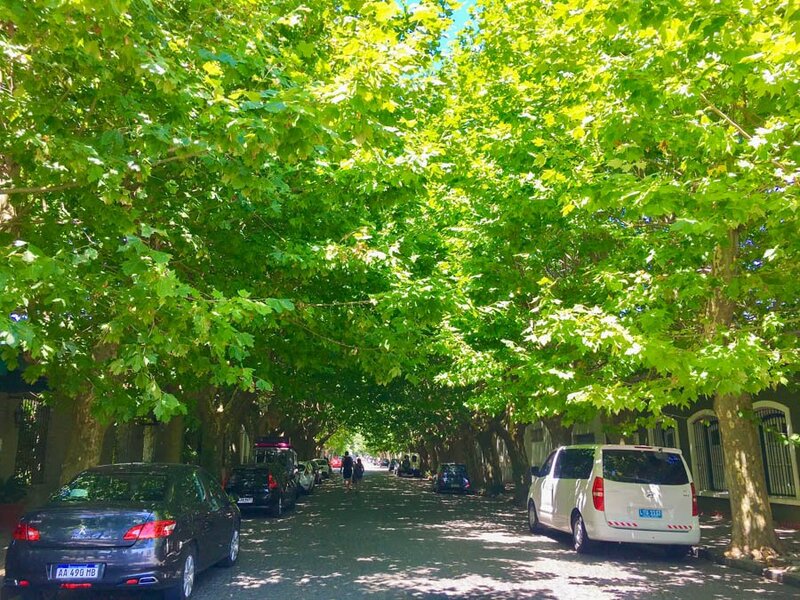 The trees covered the streets and sidewalks giving some much-needed shade. We loved how green Colonia was! We immediately “clicked” with this place because of how accessible everything felt, and how many cute little cafes and restaurants were spilling out onto the back lanes. The vibe in the old town was very peaceful and relaxed, and we knew we had made a great decision in crossing the river to a new country. 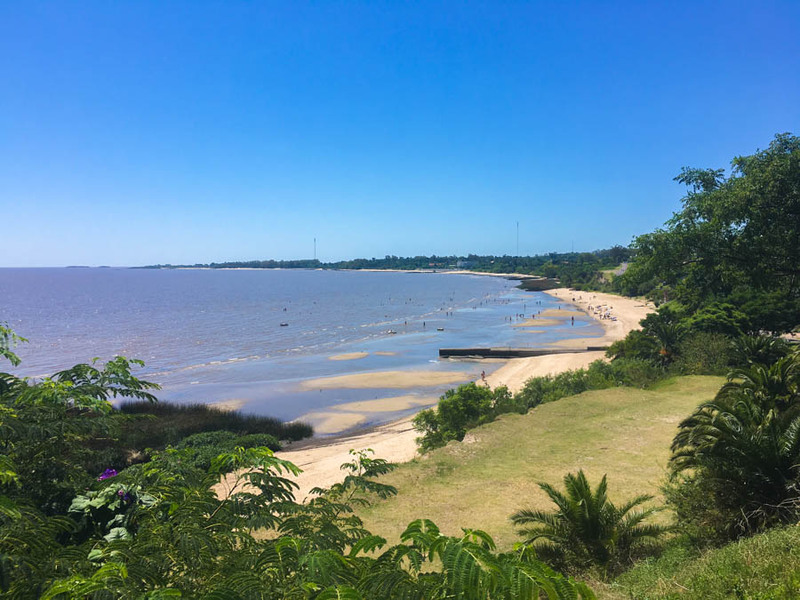 Many people choose to do a day-trip to Colonia, but we opted to spend three nights here, which was exactly what we needed after enduring the hustle and bustle of the big city of Buenos Aires for a month. After checking-in to our quaint posada, with around 10 rooms, we made our way to the rooftop and noticed about 100 people along the river’s shore – both sunbathing and swimming. Feeling like we were missing out, and because it was 30 degrees outside, we threw on our bathing suits and headed out for a day in the water! Hiring a bike is the best way to get around the city, and to explore beyond the old town. Luckily, our posada had free bikes for guests’ use and we immediately took advantage of their offer and rode our one speed bicycles towards the happy beach-goers. We arrived sweaty and dying for a swim in the refreshing river. What we found was a cloudy, brown, shallow river. But, since others were enjoying it (and because we were so hot), we decided to go for a dip. No matter how far out we walked, the water was never higher than our knees. We knelt down and sort-of rolled over in order to cover ourselves in water to try to cool off. I’m sure it was quite the sight! That lasted all of 5 minutes before we were ready to move on. 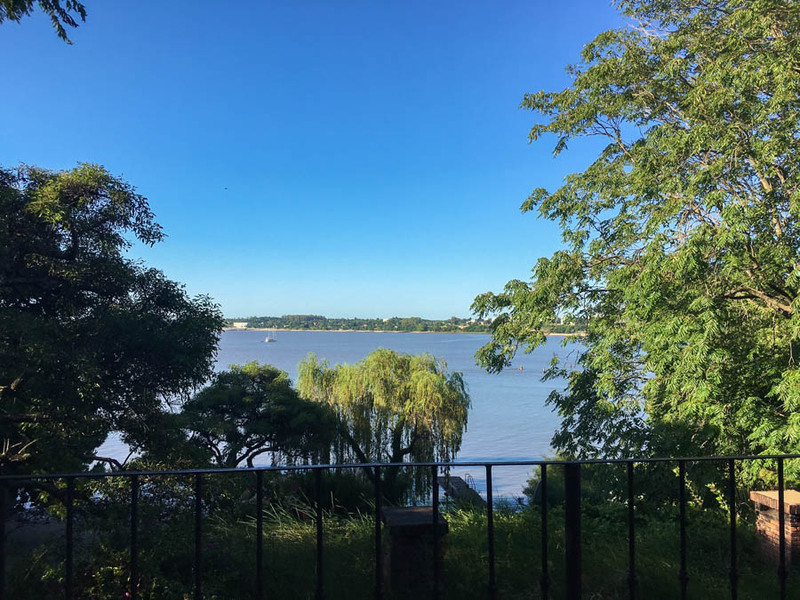 The river may have been a bit of a bust, but the other sites we visited and the restaurants we ate at in Colonia hit the mark. There was really only one busy road running through the historical center and the rest were quiet and residential. Strolling aimlessly along the back roads we encountered locals sitting on lawn chairs in front of their homes sharing their national obsession, mate, with one another while adorable stray dogs wandered the streets in search of attention and some love (which they got from us). We also came across a theatrical performance in the park and Candombe dancers in the streets. We drank beers by the river, explored the harbour, sat in the plazas and soaked up the unique atmosphere. 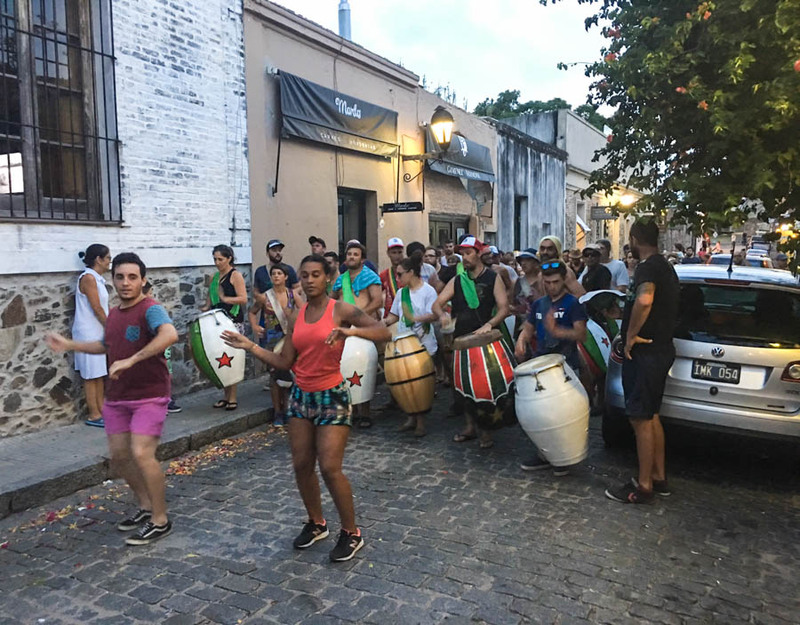 Candombe dancing is found around Uruguay during Carnival season. The dance and drumming is from the time of African slavery. 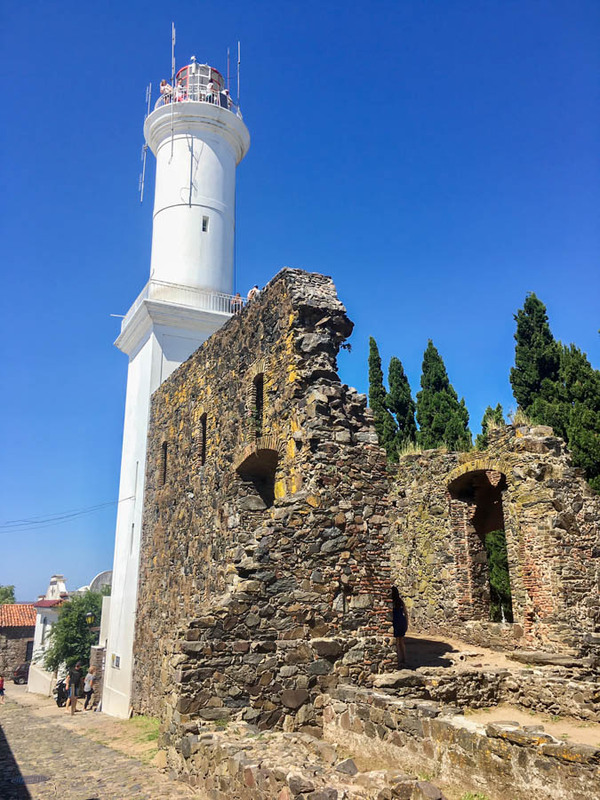 The only real “sites” in Colonia are some museums, the old stone bridge and wall, the lighthouse and the church. The lighthouse caught our eye and we made our way to the white pillar jutting out of the ground. The Río de la Plata was an important river for transporting goods, but numerous ships ended up crashing – some with gold and silver on board. So, in 1855 it was decided that a lighthouse would be built to avoid this issue, and in 1857 the lighthouse turned on its light for the first time. Although an interesting site and a great vantage point over the river and city, we found the most unique aspect to be the location of the lighthouse itself. It is set on top of crumbling ruins of the San Francisco Convent which dates back to the 17th century. The views from the top of the lighthouse, and the breeze, were fantastic. We descended down the winding staircase of the lighthouse and arrived at a narrow, cobbled street. 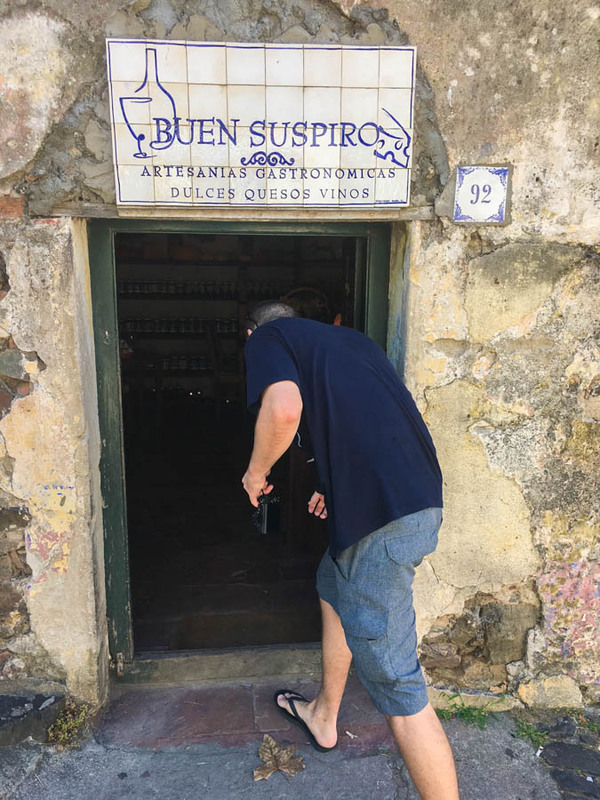 Noticing an abnormally small door with a little sign above the entrance titled “Buen Suspiro”, we decided to check it out. It turned out to be a wine bar! 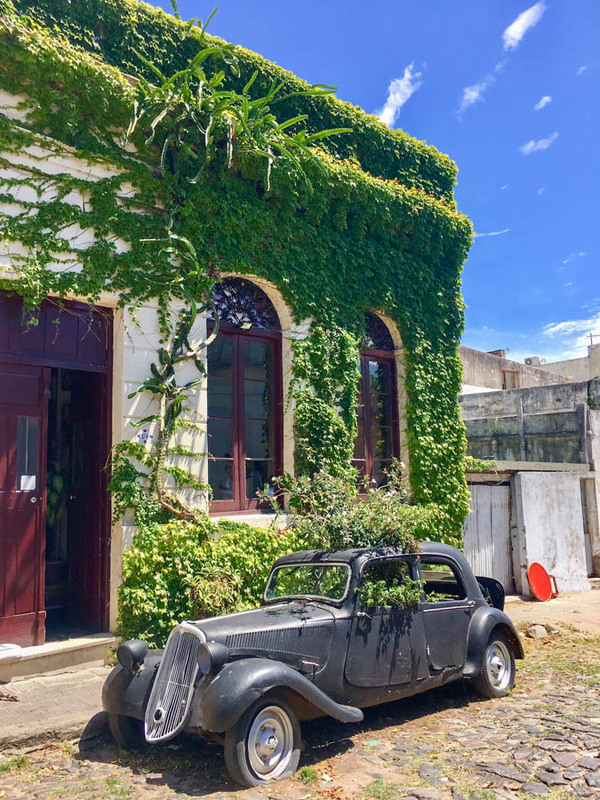 Coming from Buenos Aires, where we had our favourite wine shop Lo De Joaquin, we weren’t sure what we would find in terms of red wine in Uruguay. But, it turns out that they grow a grape here called Tannat, which we had never heard of before. This red grape has a thick skin and produces robust, full-bodied wines…while colouring your teeth and tongue purple. When we heard about this grape, we knew we had to give it a try. Ducking down to avoid hitting our heads on the doorway, we entered into the little bar. It was dimly lit, had very low ceilings with old wooden beams, and shelves full of meats, cheeses and wines. This was our kind of place! The waiter recommended the Maderos 2011 Gran Reserva Tannat, which was the first time the Tannat grape would hit our lips…but it wouldn’t be the last. 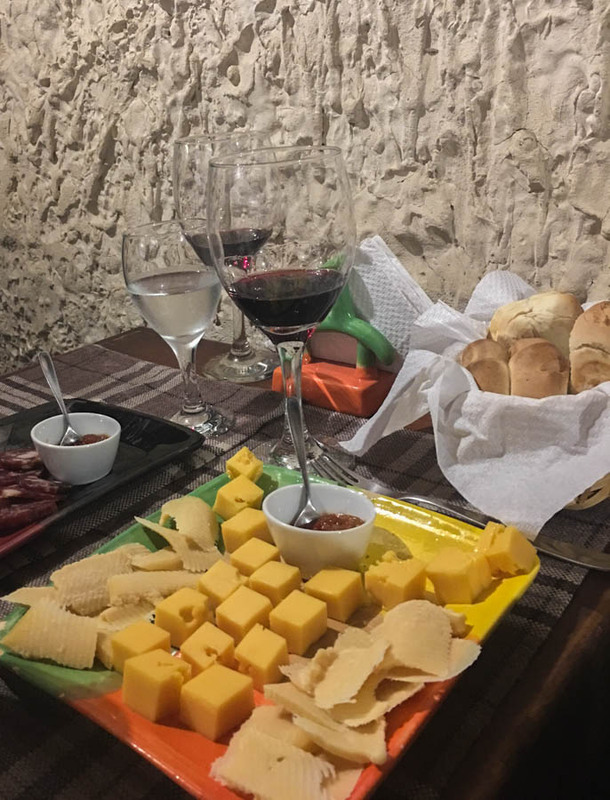 With a platter of typical local cheese and meat and a bottle of Tannat, we enjoyed our last night in Colonia in the dimly lit cellar. It doesn’t take much for us to jive with a destination. All we need is a good vibe, a variety of restaurants, cafes and bars, some interesting sites thrown in, and of course, friendly people. 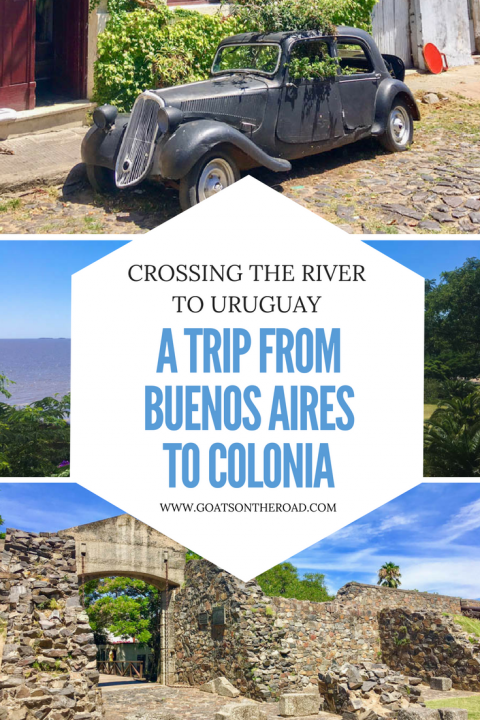 We may not have always loved our time spent in Buenos Aires, but crossing the river to Colonia really lifted our travel spirits and after three days, we were excited to move on and explore a bit more of Uruguay. There are numerous ferries travelling between Buenos Aires and Colonia. We booked with Seacat Colonia and the tickets were 550 Uruguay Pesos each ($19.40). The journey only took about an hour. Taxis from the port into the old town cost 100 pesos ($3.50). We stayed at Posada del Flor and really liked it. Breakfast is included, plus a mid-day coffee and snack. The rooftop is really nice, the rooms are clean and comfy, free bikes are available and the location was great. We paid $106 / night over the weekend in high season, it’s usually around $70 / night during the week. 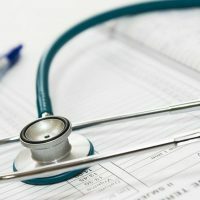 If you pay with your foreign credit card in Uruguay, rather than cash, you will receive 22% off the price of food and booze at restaurants, and car rentals! Plus, hotel rooms are tax-free. So, when paying for your restaurant bill, pay with your credit card and the price will be reduced by 22% (which is the tax) – it’s a no brainer. There are a few bus companies that travel from Colonia to Montevideo. Go to the terminal the day before and purchase your ticket. We went with Turil and the price was 354 pesos ($12.50) / ticket. The journey was 2.5 hours. For good restaurants, check out Cafe la Tasa de Te, Buen Suspiro wine bar and Que Lo Pario Mendieta. I had always wondered if a ferry of some sort operated from Uruguay to Buenos Aires, and now I know! Colonia looks pretty and really chilled-out. And I want a Candombe troupe outside my office every Friday after work – looks like fun!